Java program to convert decimal to octal vice versa octal to decimal using standard values, recursion, array, and vice versa. 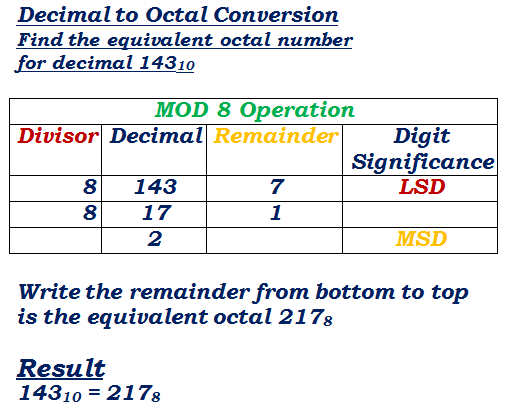 Here are the basic steps just to let you know the conversion from decimal to octal in math. If you have a clear idea about the conversion then skip the below tutorial and check out the programming – Here is the complete list of programs for beginners. How to convert from decimal to octal? For Example, take one number e.g. 1792 when it is divided by 8, you will get quotient ‘ 224 ‘ remainder ‘ 0 ‘.Followed by 224 /8 you will get Q = 28, R = 0 if you continue like that the result in octal as = 3400. Hope you get it. Here is the Java code to print conversion. Here is the code in static format #with sample outputs. Here is the code from to convert from octal to decimal.